CALIFORNIA, Mojave – March 17, 2011 – U.S. Department of Defense ( DoD ) Advanced Research Projects Agency ( DARPA ) military science and technology ( S&T ) department has created yet ‘another’ Unmanned Combat Aerial Submersible Vehicle ( UCASV ) that can descend from Low Earth Orbit ( LEO ) flightpaths to approach and submerge a body of water ( oceanic or lake ) where the target is located. From a remote-control underground desert facility ( Muroc, California ) this aerial combat submarine ( UCASV ) also employs a strategic morphing technology offense for approaching targets beneath the surface, afterwhich mission success this UCASV rises from sea depths with its delta wing ( hydrafoil ) design water-to-air surface breaking power engages its thrust-vectoring engine propulsion system aides short distance smooth water-to-air. 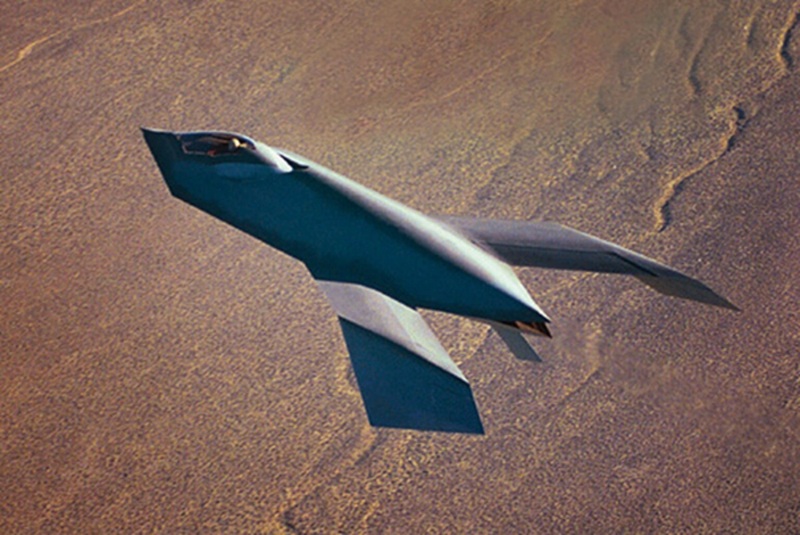 Not since the DARPA program LOCCAS powered LOCKHEED project U.S. Navy remote-controlled cruise torpedo or the DARPA program TACIT BLUE experimental BOEING project Bird of Prey combat aerial vehicle ( image above ) – combined – has a more advanced program developed, however since 2008 such proceeded beyond demonstrator development garnered several private-sector developer designs pushing a DoD DARPA project contract to have begun by 2011 building several versions. While hydrodynamics and aerodynamics have similar principle aspects, profound technological challenges existed as Unmanned Aerial Submersible Combat Vehicle ( UASCV ) must be lightweight ( Dupont carbon fiber using 3M carbon resins ) – for minimal power consumption to become airborne – while simultaneously possessing sufficient material hull density to withstand oceanic pressures at variable depths. Aircrafts that are ‘heavier-than-air’ obtain lift from wing airflow displacement, however submarines regulate buoyancy by pumping water in and out of ballasts within certain hull locations. One method of getting around the latter problem is to design a ‘lighter-than-water’ submarine with an ‘upside-down flexible ( morphing technology ) batwing aerial submarine vehicle’ using reverseable lift generation alternating ‘delta bat-wing’ directional force design technology facilitating craft navigation through oceanic subsurfaces ( and upon surfacing therefrom ) where drag reduction is virtually eliminated by easily altering its ‘flexible whale tail angle of attack’ generating upward lift allowing a variable propulsion drive system to move the Unmanned Aerial Submersible Combat Vehicle ( UASCV ) amidst a variety of environments. Modified versions of BOEING legacy Rocketdyne XRS-2200 AeroSpike thurst vector navigation ‘lateral engines’ ( 2 ) – based on those formerly used in the U.S. Air Force LOCKHEED F-117E Stealth Reconaissance Fighter ( image ‘immediately’ above ) – are used in miniature tandems ( 2 ) on Aerial Submersible Vehicles ( ASV ). The Unmanned Aerial Submersible Combat Vehicle ( UASCV ) ’satellite blue-green laser-guided remote-controlled navigation propulsion and underwater optical sensing detectors and camera systems’ remains as sensitive as the DARPA LOCCAS powered remote-piloted submersible torpedo ‘satellite blue-green laser-guided remote-controlled navigation propulsion and underwater optical sensing detectors and camera systems’.